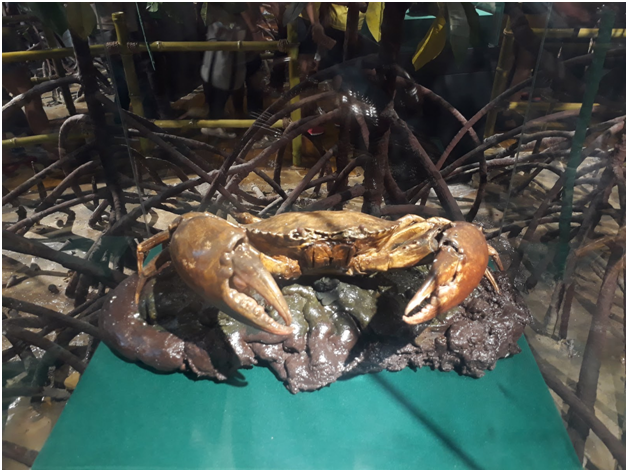 If you’re a flora-and-fauna enthusiast or a regular folk interested in biodiversity, you’ll get your fix at the National Museum of Natural History. 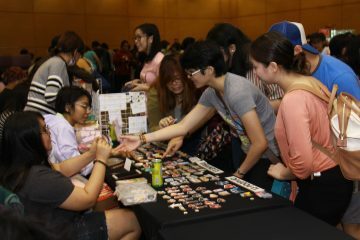 The museum first opened its doors on May 18 — just in time for the International Museum Day — and welcomed over 3,700 visitors. 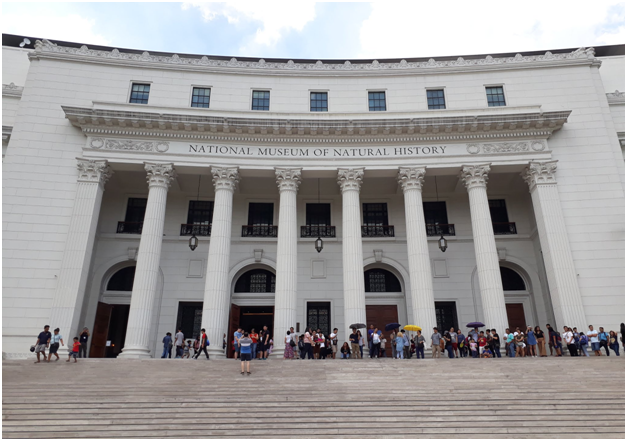 The National Museum of Natural History is now part of the National Museum Complex in Manila, which includes the National Museum of Fine Arts, the National Museum of Anthropology, and the National Planetarium. 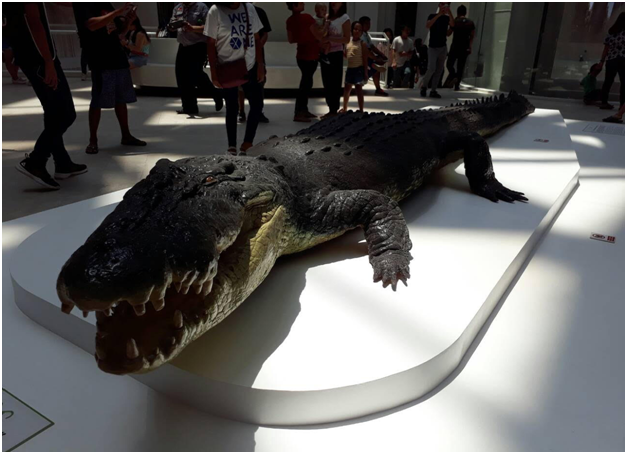 The museum boasts more than ten galleries that include Lolong — the world’s largest crocodile that was in captivity — and various specimen displays. 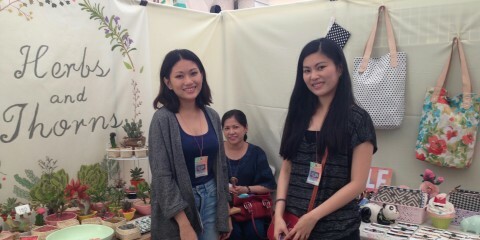 All you need to do is brave the long lines at the entrance, and you’ll have exclusive access to unique plants, animals, and fungi in the country. The museum is open from Tues-Sun from 10:00 AM to 5:00 PM. 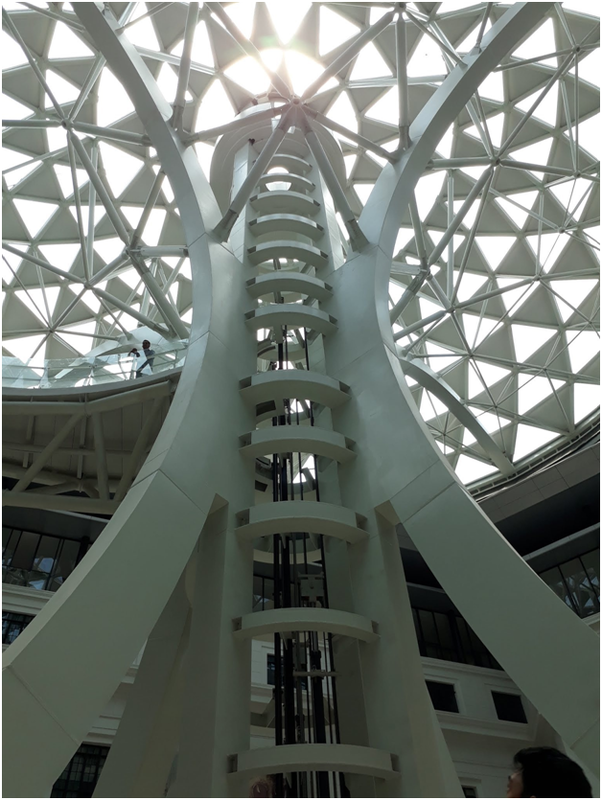 A DNA-helix shaped elevator named The Tree of Life greeted us at the foyer. Located in the middle of the area, the elevator offers a scenic, 360° view of the museum. Sunlight streamed through the structure’s glass-paneled domes, resembling a canopy. We saw guests crowd around and take pictures of the replica of Lolong. The gargantuan reptile measured almost 21 feet from snout to tail. Lolong died in 2013 after multiple organ failures due to the stress of its captivity. After taking IG-worthy photos of the huge replica, we viewed the stuffed endangered eagle specimens and saw “Gemma,” the stuffed eagle named after the museum’s first female director, Gemma Cruz-Araneta. Behind the iconic Tree of Life, we took the ramp downstairs to the basement floor, where we were greeted by beautiful displays: a 66 million-year-old mollusk, a huge, off-white stalagmite, gorgeous stones from La Union, and paintings of flowers native to the Philippines. A long staircase leads to the upper galleries, which showcase the various flora and fauna in the Philippines. 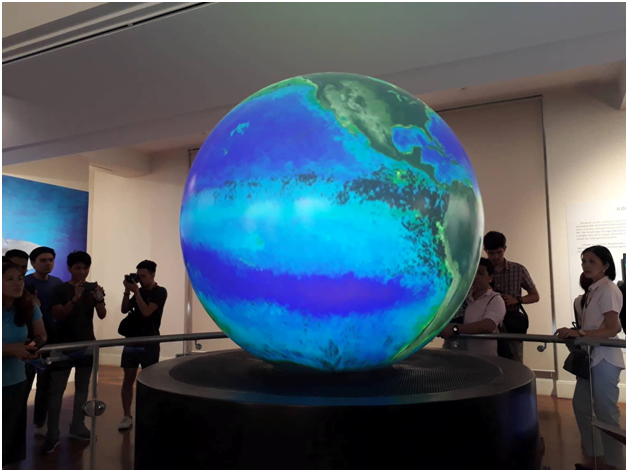 Visitors pooled around an electronic globe that animates sea currents, phytoplankton movements, tsunamis, and more. 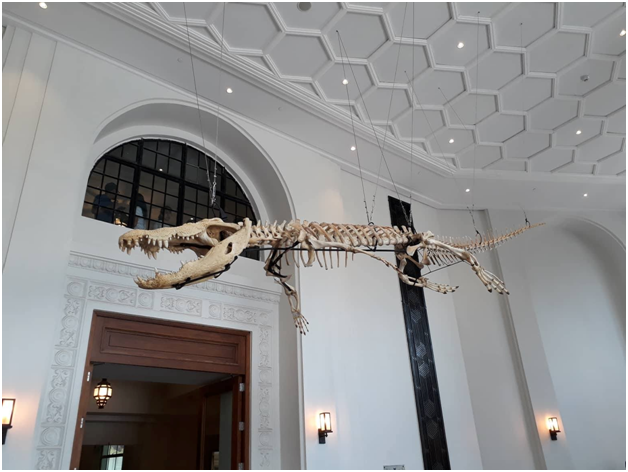 We also saw the actual skeleton of Lolong, suspended in the ceiling. My co-writer and I agreed that it was definitely huge — it had the makings of a terrifying predator. 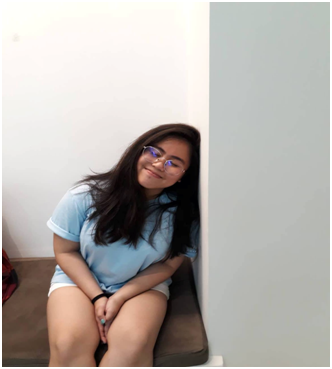 Other displays include the bones of a butchered rhino in Kalinga and the tools that the early inhabitants of the islands used to cut the bones and reach the marrow. For history buffs, the second floor houses a gallery dedicated to the country’s naturalists. It features the Philippines’ pioneers, insect specimens, and a couple of interactive displays. 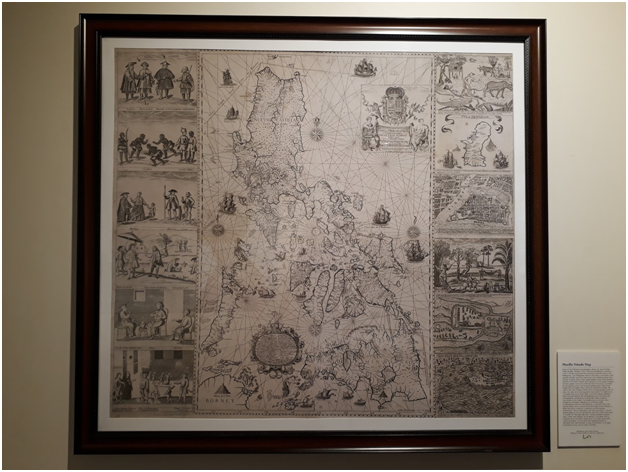 We spent more than ten minutes gawking at a replica of the Murillo Velarde Map, the first scientific map of the Philippines, which showed the maritime routes from Manila to Spain and Mexico, then called New Spain. And although the map was published in 1734, we still tried to find our hometowns and famous attractions. We also saw an uncanny replica of the Rafflesia, the world’s largest and smelliest flower (minus the odor). 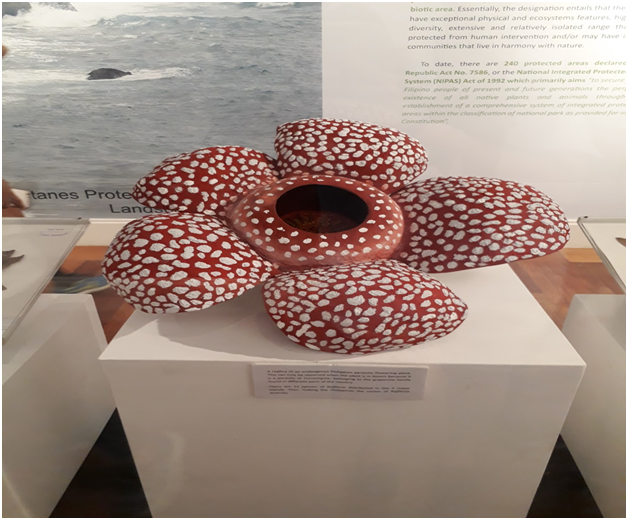 Thirteen species of this parasitic plant are distributed across the three major island groups, making the Philippines a center of Rafflesia biodiversity. For those who aren’t familiar with the natural treasures that we have, the museum has a viewing room that airs a documentary about the UNESCO World Heritage Sites in the country. It features the Mount Hamiguitan Range Wildlife Sanctuary, the Tubbataha Reefs Natural Park, and the Puerto Princesa Subterranean River National Park. The audience sat on comfy chairs in complete darkness as the video narrated the species that each ecosystem hosts, the conservation efforts they receive, and the prestige they give the country. We aren’t big nature girls, so we really appreciated this video. 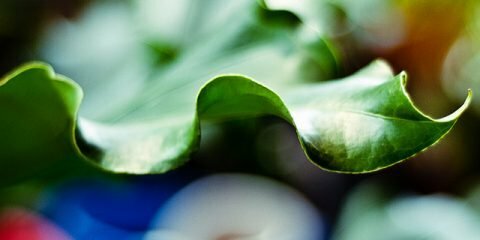 It’s a great introduction to what the Philippines has to offer, and we were astounded by the sheer amount of plants and animals that we’re blessed with. On top of that, the comfy chairs were a welcome break after hours of standing and roaming around. And speaking of rest, the museum was kind enough to install these couches by the corridors for tired museum-goers. The Philippine terrains tell only half the story. The third-floor houses galleries devoted to the life that abounds in beaches and seas. We saw life-sized replicas of mangroves, complete with displays of majestic creatures like the Collared Kingfisher, the Rufous Night-heron, and the Mangrove Crab. It was also hard to miss “Pawi,” a green turtle with a beak-shaped snout. Behind Pawi was a diorama of small sea turtles housed in glass displays filled with sand. We had a great time checking the galleries. Unfortunately, according to the directories, at least eight galleries on the fourth and fifth floors are not yet open to the public. Nevertheless, we still had our fill of nature and history. We don’t know when the galleries will open but one thing’s for sure — we’re definitely coming back. Come early. The museum opens at around 10 am, but we recommend arriving at least half an hour early. Lines get really long, especially after lunch. It’s best to start early and enjoy the displays without too many people. Bring foldable umbrellas and fans. 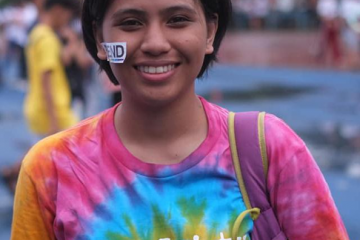 The Manila heat is unforgiving, and you might stay out lining up in the sun. And although the museum is air-conditioned, you might be uncomfortably hot because of the crowds. Bring a small bag. 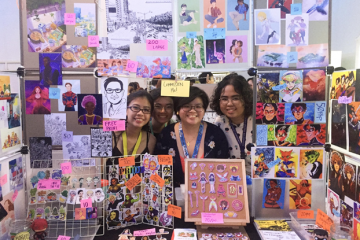 We saw a sign that says “bags larger than a short bond paper are not allowed.” We didn’t see anyone’s bag deposited by the entrance, but it’s best to be safe and bring only what you need. No flash photography. We suspect that the bright light hurts the delicate displays. Lastly, have fun! The museum is not reserved for lab coat-clad scientists and Indiana Joneses in khaki pants. 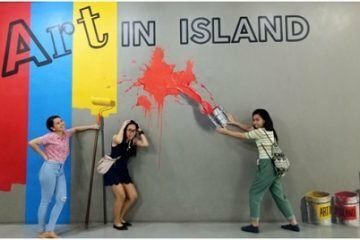 It’s open for everyone, young and old, who want to see the beauty that the Philippines has to offer without traveling too far.